Traffic in, out, and all around this city of Rome is an absolute nightmare. I remember that as I was driven out of Rome to our hotel if Fiuggi, where we stayed for three nights, I was impressed by the driver's skills, but distressed at how many different sections of motorway we seemed to quickly join and then leave in order to simply make our way out on the correct route. Had I been driving it would have been an unmitigated disaster, that is for sure, and I would have needed to stop and hail a taxi to lead me the way out of this Roman maze and mania. Putting it mildly, the Italian drivers hereabouts - I'm trying to be kind here - are opportunists to the highest degree. If there is a space big enough for their car and it is ahead of them then they fill it. Then there is la moto - or hair-dryers, as Roy Boy preferred to call them because of their charcterstic hum. These noisy little scooters are a favourite form of transport: 'trans' because they get them around; 'sport' because they enjoy the cut and thrust of cutting up cars and thrusting themselves into vacant space. Around Rome they have some great rush hours. (Who invented this phrase to describe streams of traffic that just cannot rush?) Cars crawling along are not match for the hair-dryers and they weave in and out with reckless abandon and proficient efficiency. Driving into Rome is an experience in itself. Like any major city, the suburbs are generally not a good advertisement - although the Roman ones are a good advertisement for Rome's greatest export: graffiti! Let us not overlook the fact that this is an Italian word, and that the Italians are not backward with their talent here: nor are they modest. Everything is fair game, from city walls to motorway screens. Transparent screens provide both a noise screen and a blank canvas, and the graffiti artists just love them, for they get double value: their work can be seen from two different directions! Rome was not built in a day, they so rightly say, but the truth is that it is constantly being rebuilt! This is the ultimate in recycled cities, for no ruin has historically been left idle for very long: it is the source of such good - and free - building material. This is particularly evident as you head in towards Vatican City past the city wall once, apparently, a fine sight of stone and marble. But the Romans invented just about everything before the rest of us today, and that included cladding. In fact, they went a bundle on cladding! So apparently solid stone or marble structures were really brick constructions clad with more costly and impressive material. Yes, we are really talking bricks here! They look much like modern bricks, although the lime mortar they used was not quite so sophisticated as today. So all over Rome you can see the ancient bricks peppered with holes. These holes were used by the pins that held this superior cladding in place. All over Rome there are classic buildings that have taken on new leases of life as something completely different: pagan chapels became churches, ruins became foundations for new, more modern structures, and ancient structures simply became part of the new fabric. The history of Rome is indeed within the very fabric of everything and that is what makes the place so fascinating. Amazingly, even on a building of such stupendous interest as the Colosseum, you will find a peppering of holes even among genuine stone blocks. Why? Because the plundering builders chipped into them so they could recycle the pins that were used to tie the blocks firmly together! Nothing is wasted here, you see! 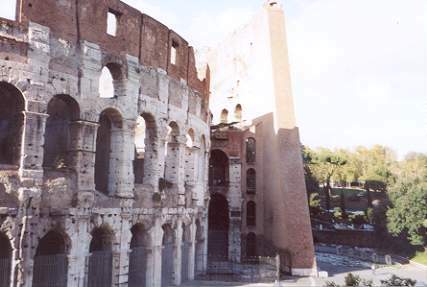 The original structure of this great amphitheatre was begun by Vespasian in 72 AD and was built by Jewish prisoners. Emperors such as Vespasian were canny men and they knew that in order to survive as conquerors of the world, they needed to keep the general populace on their side. (Presidents and Prime Ministers of today please note!) They also needed to cultivate the war-like spirit that made and kept Rome so great, and a stadium in which everyone could be freely entertained by gladiators, trained to fight to the death, seemed great way to achieve this. (The sports of today have this same root function although we now tend to frown upon violence extending much beyond broken ribs and bloodied noses.) Entering and leaving by numbered entrances all around the circular stadium, people waved their clay tickets and had a great day out. The seating arrangements went from the Emperor's great seat, senators, members of the court, knights and civil and military tribunes. Finally came ordinary men and lastly, it has to be said, women: the latter far away and above the carnage of men killing men, men killing animals, and animals killing men. (And Christians maybe, although there are Romans today who would like to argue there is no specific evidence of this. Personally, I wouldn't have expected lions to leave much evidence.) After the bodies had been removed to tidy up the arena a bit, during which time there was no doubt a nice interval for snacks such as lion-burgers - the arena was often filled with water in order to stage naval battles. (Don't ask me why it didn't leak. Just tell me.) This plan saved the emperor traveling the few miles to the sea or leaving his comfortable seat and lion-burger. In fairness, it should be said that Emperor Constantine and his immediate successors tried to put an end to gladiatorial fights but the general populace did not want an end to such riveting entertainment. 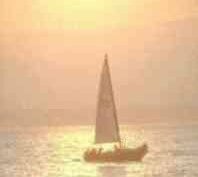 It took a monk called Telemachus, at the beginning of the 5th century, to enter the arena and try to put himself between battling gladiators to bring sanity to a head. The crowd hurled insults and rocks at the monk, so killing him, but that day the games were brought to an end and he became a worthy martyr. Not so far away from the Colosseum is Circus Maximus, a great, elliptical race-track, really, where more free entertainment - chariot racing - kept the common populace rooting for emperors that gave so freely for their entertainment. So cunningly positioned were they that the emperor did no have far to go to reach either of these areas of public entertainment. Indeed, the Imperial Palaces looked down upon this grand structure - now little more than a field - from the small Palentine Hill and the two structures were adjoining.You can still see the naked brickwork of the palaces in their final incarnation. 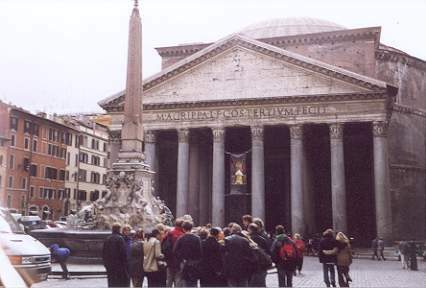 The Pantheon is said to be the Glory of Rome because it is the only architecturally intact monument from classical times. The original structure was built by Agrippa in 27 BC and dedicated to the gods of the Julian family. 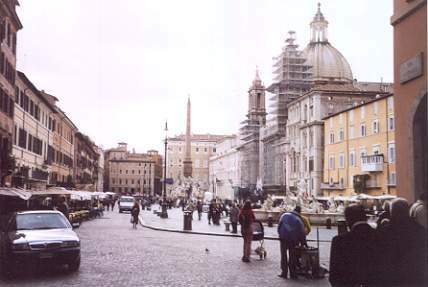 It was destroyed by fire - or the gods - in 80 AD, then completely redesigned and rebuilt by Hadrian in its present form. 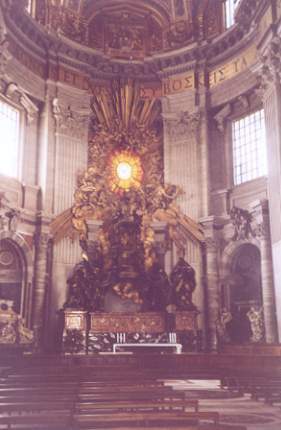 In 609 AD Emperor Phocas gave Pope Boniface IV permission to change this pagan temple into a Christian church. Most notable about this structure is its dome, like St Peter's, built with an original hole in the top. Why? They worshipped the sun in those days, and this gave this particular god a chance to lighten their lives. While the inside of this dome is impressive in structure, it is a veritable blank canvas when compared to its sister in St. Peter's. 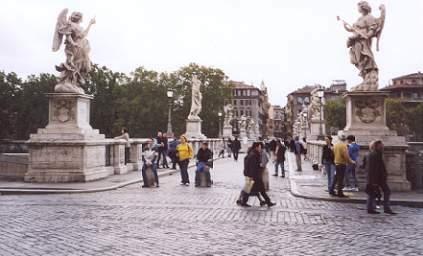 The walk towards Vatican city from Piazza Navona takes you along by the River Tiber and requires you to cross it by one of its several bridges hereabouts. (Romans are not expected to walk far out of their way.) 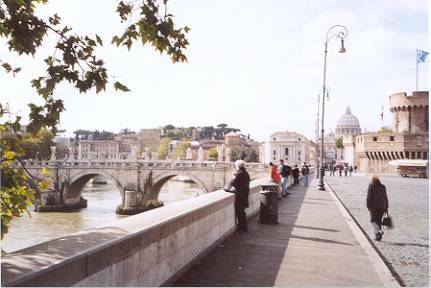 This view shows the famous river and the distant dome of St Peter's on the skyline. The fact is that before Rome became the integrated city it is today, it formed two different townships on either side of this river. A natural island in the river - Isola Tiberina, once the location of the Temple of Aesculapius, the Greek God of medicine - now contains the church of St. Bartholomew, and present-day bridges to both sides of the river echo the island's great importance in the dim and distant origins of the region when such bridges linked together two communities that would unite them for their common protection as an important place of trade. One of the bridges hereabouts is the Bridge of Angels. The area is strong on angels because, during a solemn procession led by Pope Gregory the Great in 590, to beseech the Virgin to put an end to the plague that was then devastating the city, an angel appeared in the sky and landed above a mausoleum, sheathing his sword as a sign of grace granted. A chapel was built in honour of the angel, followed by a statue to recall the miracle. This is now the site of the Castel Sant' Angelo, a fortress that has both housed many famous prisoners and later provided a sanctuary for the Pope in the event of his life being threatened. An angel surmounts the castle today - and an elevated escape corridor runs from this castle directly to the papal buildings in the Vatican. The very fiercest of troops, the Swiss Guards, were long ago hired as the most reliable mercenaries to defend the pope, and they are still in evidence guarding the Vatican today. If you catch their uniforms, you will realise how fierce they must be to be able to get away with wearing what looks very like a joker's uniform! 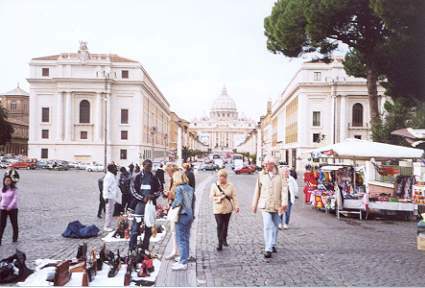 Walking towards Vatican City, past street traders, it is hard to miss the dome of St Peter's - as you can see. Did you know Vatican City is, in effect, a quite separate state within Italy? It is, indeed, true: as from 11th February 1929, when the Lateran Treaty resolved the 'Roman Issue'. So they now have their own laws, own currency, own post office, own Pope. True, we all have him, but this is his very own principality. 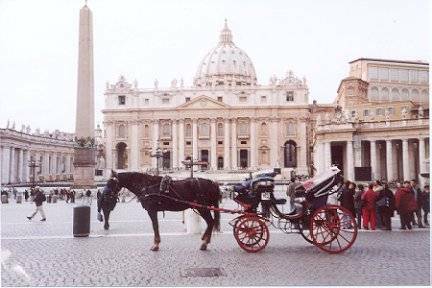 Once you are within St. Peter's Square, look at the building to the right of St Peter's, and to the top storey of the papal block. I am reliably informed that the window from which the Pope is often seen to waive is the second from the right. This would tally, for it puts him on the correct side of the building to make a quick get-away down the secret passage to the castle in the event of trouble! I imagined St. Peter's Square would seem huge. In truth, I have to say, it did not seem that way. I imagined St. Peter's Square would seem huge. In truth, I have to say, it did not seem that way. But then that might just be the uncanny knack of master architects and their grand designs. The site was originally the great Circus of Nero: those emperors did, as you will have by now gathered, flourish on being entertained. Well, there wasn't any TV then, after all. St. Peter was crucified here (circa 64-67 AD) and his body was buried nearby. More than 250 years later Constantine built a magnificent basilica on the spot that was destined to become one of the wonders of the world. In line with just about all Roman architecture, was was originally built fell into disrepair and was subsequently redesigned and rebuilt. Pope Julius II began the present structure, but I guess he didn't live to see the results: it took some 176 years to complete. Several different architects, with several different plans, set to work on the structure over these years, but it was Michelangelo, then almost 70, who began to build the great dome of what was to become St. Peter's Basilica, the greatest - and biggest - church in Christendom. Poor old Michelangelo died in 1564 when only the drum had been completed, and it was not until 1589 that it was finished. Within St. Peter's Square the most striking feature is the Colonnade, Bernini's most beautiful work, the two spreading arms that exude from the basilica to represent the outstretched arms of the church wishing to embrace all of mankind. Bernini also designed the 140 statues of saints that decorate the colonnade, oblivious of the fact that subsequent popes would create more saints than he could dream of, and a colonnade to honour them all would probably loop the square several times over. I would just mention that there was one of those anti-tourist traders at a stall just across from the square selling newspapers, calendars, and the like. She gave the now familiar grunts of despair as I tried to establish that the calendar that interested me, securely wrapped in cellophane was, indeed, in English, then proceeded to abandon her post the moment I proffered Euros to support her and her family, so that she could have a conversation nearby with an acquaintance. Ignoring my waving Euros, she did eventually return, in her own good time, and grabbed by money, selling me a number of calendars all of which, I discovered by later comparison and peeling off her labels, were well over-priced. So here is my advertisement for this charmer. I hope she appreciates it. I would advise turning your back on St. Peter's and going a little further down the street to those establishments with heavier overheads but lower expectations! If you've got postcards to send to friends back home, by the way, take time to post them from the Vatican's very own post office hidden to the left of the square through the colonnade. Not only is the stamp worth including in your gift home, it will also get there far more efficiently than from some other post boxes in Italy. The pope, you see, rules a tight shop. Roy Boy handed us over to a rather petite Vatican guide, complete with her own portable PA system and umbrella. She took us through the airport-style security checks before we were allowed to enter the hallowed ground of St. Peter's, and then led us inside that amazing building. Empty of pews, enormous yet, deceivingly seeming smaller than it really is due to its classical proportions, the basilica is triumphant in its architecture - and boastful, in a discrete sort of way - of the fact that it is, indeed, the biggest church... ever. It proves is by inscriptions in the floor showing the length of competing buildings: such as St. Paul's in London. When you look up to the dome, and see the large letters inscribed around its drum base, it is hard to appreciate these letters are the height of a man. 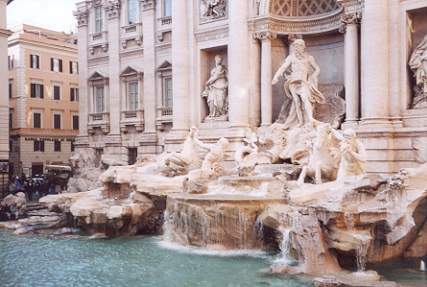 All churches, however, and Salvi's Trevi Fountain shows us a lighter side to Rome. This is where you are told to turn your back and throw a coin into the fountain if you want to be sure to return to Rome. Less well known is the fact that if you throw two coins in the fountain you are asking to return married. Toss three coins in and you will return married: to someone different! I guess this will be assured if your spouse sees you tossing three coins in! This, the most sumptuous fountain in Rome, celebrates the return of running water to the city after long, dry years of privation that threatened civilized life as they knew it. The relief on the right of the fountain is said to represent the legend of Agrippa's soldiers who. looking for water in the via Collatina, met a maiden who showed them the source of pure water that was subsequently brought to the city by aqueduct. An Ice Maiden to the soldiers, maybe, for the source is known as Virgin Water. Rome is, of course, a place of romance. So perhaps we can understand the gentleman in our group with shorts, wide, centre-parting, knobly-knees, around 58 if he was a day, being the first - and only one - to hasten to our umbrella-laden Rome guide to introduce himself personally; let's just call him Romeo for now. He was always nearby catching each pearl from her ruby-red lips, walking alongside her as we made our way around Rome, and then, finally, at the foot of the Spanish Steps, with trembling lip I heard him pronounce to her that he had "fallen in love with Rome twice that day, and only once with the city." How perfectly cute of the one H and I remember as Romeo. I'm not too sure what his wife calls him, though, for she was a desperately spare part in Rome. The Spanish Steps - the guide told us why they were so called but I was still so moved by Romeo's parting speech that I could scarcely take it in - rise majestically from the Piazza Spagna, from the graceful Fountain of the 'Barcaccia' by Bernini up to the church of the Trinità dei Monti with its two cupolas. Now I'm no architect of course, but I just hate the kind of thing offered beneath these two cupolas: two round holes, perfectly balanced, and one round clock in the left-hand one, making the empty right-hand one look out-of-kilter. How about two clocks: an hour hand in the left-hand one and a minute hand in the right-hand one. that would get the church more talked about, surely? Still, such genius was evidently in short supply in the time of P. Bernini, who did, at least, make a creditable job of the fountain (except for the leaking boat). Another name for the Spanish Steps is the 'Blue Steps': because it is a meeting place of students and their customary jeans turn the steps blue. Rome is a place of old ruins, and if you walk down the street opposite the steps, wherein lie some of the most famous names of fashion and excellence, then you will be where many a man has also faced ruin! You might just see one staggering out of Gucci. Final impressions of Rome? It wasn't built or updated in a day, and to do it justice, you need several days to see the places you should see, and more if you want to see the places you find you would also like to see. And, yes, it is worth seeing. For Rome is a city unlike any other, eternal in that it oozes history from every stone. It deserves time to relax in. Now, lets remember. How many coins did I throw in that fountain? 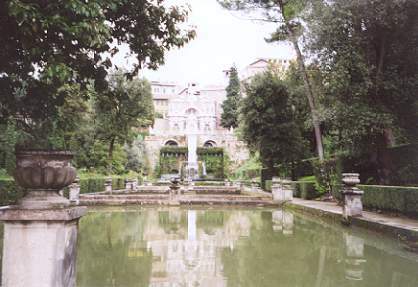 Tivoli is a town that is also best known for its water, for the grounds of the Villa d'Este contain the most triumphal exuberance of water there could ever be: in terms of man-made structures, I mean. Unfortunately, Nature decided to compete the day we visited Tivoli with the principal aim of visiting the villa's gardens, commonly known as the Tivoli Gardens. Now you may have seen water gardens before, and today it takes some great pumps to power anything very impressive. Roman methods were more basic. The plan here was to divert half a powerful river, fully utilize it in the gardens, then send it on it way, Nature briefly tamed by Man. And what an achievement! Even ignoring the water that poured from the sky - which was not easy - the water in these gardens either leaves you breathless or wanting to visit a smaller architectural building. 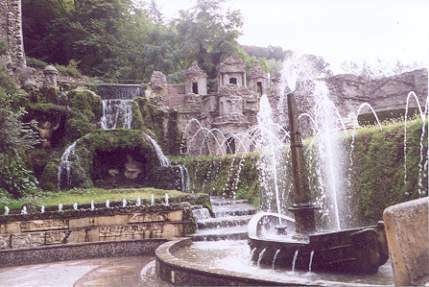 It seems to spring from every corner, and orifices spouting water surround you as you descend the slopes of the gardens to the various ponds, fountains, and networks of sculptured, moving waters, eventually to reach terraces overlooking fabulous views. There is spouting water here as far as the eye can see - and as far, and as high, as the Romans could project it. Be amazed. Then there is also the building itself, something not without interest. As for the town itself, well, it is not going to impress you too much - unless, of course, you are slow crossing the street there: in which case, judging by the local inhabitants, you will be greatly impressed. Did I mention we were staying in Fiuggi for our sojourn near Rome? I think so, for it made quite an impression on me. Our family-run hotel was billed to give us an authentic taste of the real Italy: especially in terms of food. So here is a run-down of a typical foray of courses. Soup: with a hint of vegetable: typically three peas. Followed by the inevitable pasta dish. Followed by a meat dish with a hint of vegetable (such as a slice of onion or tomato pip). Followed by a salad: typically lettuce, cabbage, a bigger hint of sliced tomato: usually on your neighbour's plate but not yours. Depends on what sort of luck you carry round with you, really. Then the dessert: if you were lucky. Typically two small cakes joined at the hip, seemingly embarrassed by their juxtaposition. Back to water. Here you are wisest to get it in the bottle, and the hotel specialized in irreplaceable crown-caps, so unless you carried around your own bottle opener - mostly confiscated earlier on your swiss-army penknife at the airport or Vatican City - you had to carry opened glass bottles around. Nor could I find water in the town itself: delightful though it was. It was a touch ironic given this place is a spa famed for the curative powers of its water: which you must pay to enjoy on the outskirts of town - along with millions of Italians, if you get your timing wrong. They really go a bundle on spa water in Italy. But, back to the town. It was a beautiful little place with real character - and and old part hidden away up the mountains if you were more adventurous than me: the waters from the sky put me off on the one available opportunity. All that I saw I liked. Leafy trees nudged its outskirts, and elegant shops beckoned its tourists. Not that aI liked everything about my stay there. Like the cold that hit me and H. Plus the trauma of my trusty camera breaking after being awed by Rome. The later event then became a burden during the rest of my Italian adventure, threatening my column day by day. And it explains why I can offer no pictures to show you the enduring charm of unspoiled Fiuggi. My camera was spoiled. So I can only tell you about it. Each morning I took the short walk into town past the old man sweeping at the leaves. Each return I could see no evidence that he had made any impression on Nature's carpet: but then there are a lot of trees around Fiuggi. It is, incidentally, also the region from which the famous avantine stone comes from: much beloved in Rome and the entire area. I guess we got the timing a bit right here, though, for I gather that there were 4,000 athletes staying in the town the previous week. And I gathered from Roy Boy that the party visiting him the following week were all square-dancers. The inhabitants of Fiuggi clearly never know what to expect next! A superb gallery of pictures on Italy. It includes a section on the Tivoli Gardens. If you enjoyed reading the above article then you will probably also enjoy Tenerife by Ed, and Croatia, also in Europe, and our latest articles covering the Orinoco Delta, La Mata, Marbella and Beijing.